As you can see this basically looks like Teapigs. The box is the same, the colours are the same, the tea temples are renamed teepees but otherwise this is the same demographic. Now - I'm not an expert on the luxury tea scene - this could well pre-date the TeaPigs branding, but it seems that more expensive teas do better when the imitate the market leaders. So lets have a cuppa and see what it's like! The first thing to notice is that the smell is intense. There is a lot of coconut smell here and it's kind of off-putting! I know that I deliberately chose this due to it's inclusion but expected it to be more like the delicate hints of jasmine that I like in my favourite green tea. The second thing is that it's a lot stronger in caffeine than I'd expected. Maybe I overbrewed it and caused both of these together, but this works more for me like a regular cup of tea than a lighter drink and wasn't a good choice for late in the day. I relocated these to work where the extra alertness is a plus. 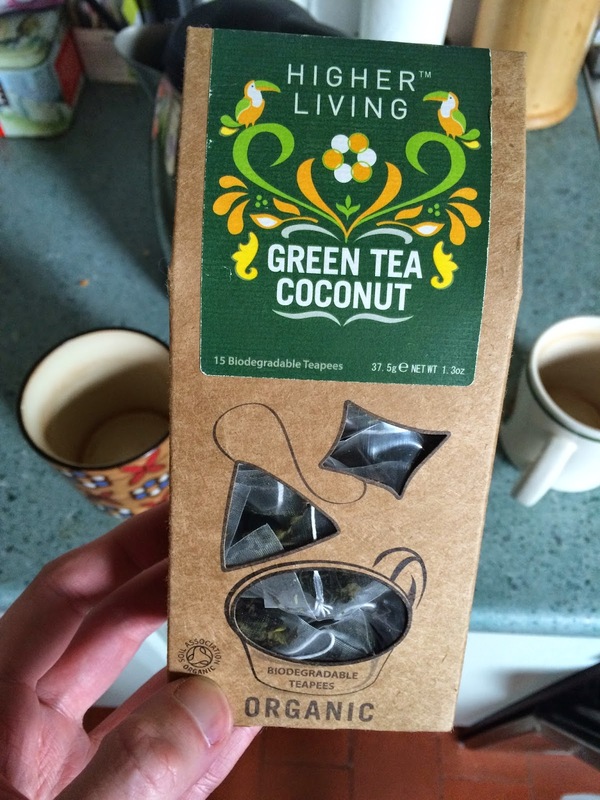 It tasted much nicer than I'd expected from the intense smell, the coconut was a nicely sweet layer of the deep tea tastes. I wouldn't say that it was quite as luxurious as the teapots green tea I have but it's kind of aiming for a different spot. It's certainly interesting enough to want to pop back to Holland & Barrett to find other teas from this range, and nice enough that I'll have no problems finishing the box. This is one to have as your first drink of the day on a dark winter morning, where the smells and tastes remind you that summer will always come back (although the weather at the moment is more like tropical storms anyway).